View the complete system brochure. Hand hygiene: No-touch dispersing is more hygienic and reduces the spreading of germs as the user only touches the towel and not the dispenser. 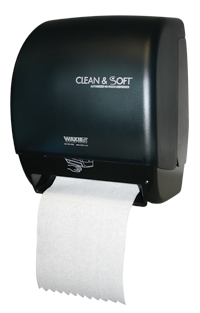 Regulates paper size & reduces waste: Dispenses one 12″ towel per pull and automatic stub-roll transfer. Secure: Locking cabinet prevents pilferage and water resistant. Complies with ADA regulations: Clean & Soft dispensers meet the Americans with Disabilities Act guidelines when properly installed. 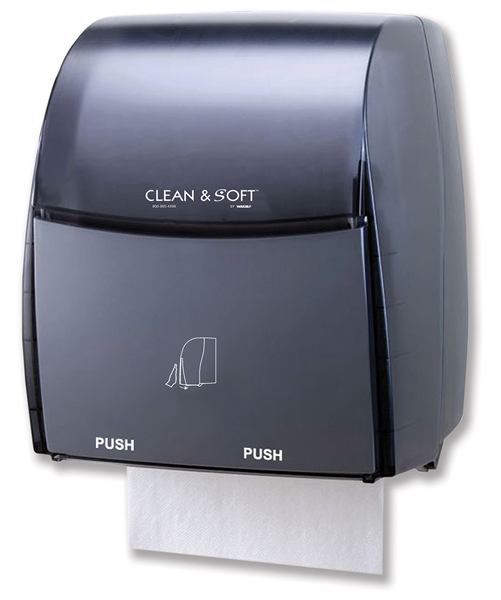 Adjustable touchless dispensing: Paper lengths from 9″, 12″ and 15″. 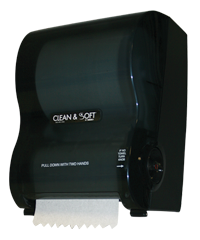 Saves paper: Paper saver mode deducts 2.5″ or 5″ from second towel and automatic stub-roll transfer reduces waste. Easy to operate: Can be pressed anywhere on the cover to dispense towels. Optimal performance: Loads easily, and can be customized to optimize performance and grade of paper.